It’s 2014 and the Critic hasn’t written anything about Vancouver in a long time so here are some new great places to stop at if you have cruise ship reservations to go to Alaska which seems to be the main reason Mexicans at least get to Vancouver. That, and to study English for a few months and get out of the house and from under the thumb of the catholic household and cut loose. But the Critic digresses. Here are some new favourite spots. Yes, that’s a Canadian spelling on ‘favourite’. Once Stephen Harper – along with his army of evil Cheney-like minions – takes over the world you will all be spelling it this way. Another digression: will be EVER get to the restaurants. 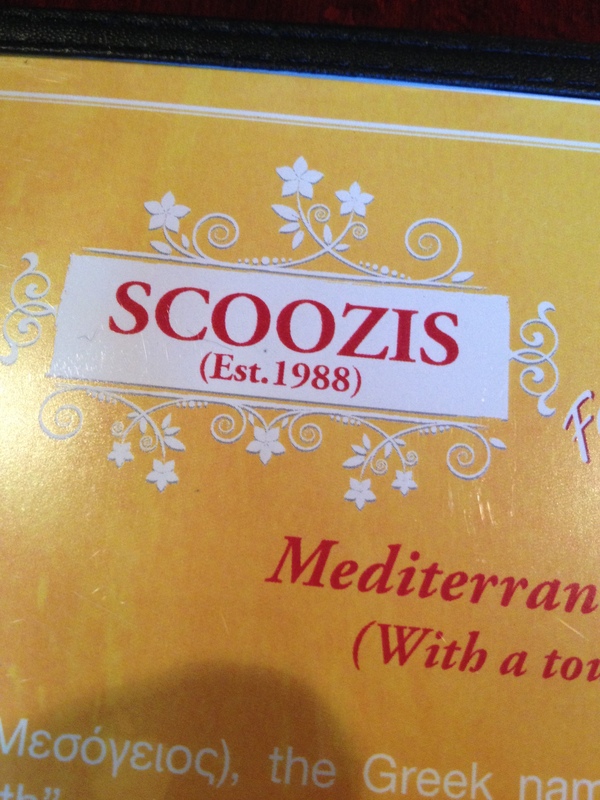 Scoozis was recommended by the nice young man at the front desk (does this sound like an old lady talking or what) when Better Half and Señor Critic asked for someplace where they served real fruit juice for breakfast, not that crap from concentrate. By the way, the word ‘crap’ was not used in the query so no need to worry – in case you were – about offending the locals and besmirching the reputations of Mexicans abroad, as if that needed any more besmirching (think World Cup and “eeeeehhh puuuto!!”). Not only did they have fresh squeezed fruit juices, but also the best eggs benedict anywhere. Mr. and Mrs. Critic fell for this suggestion like over-ripe guayas and were at Scoozis in just under 2 minutes, as it was located right around the corner from the hotel. Service was fantastically friendly, not a grumpy face in sight. 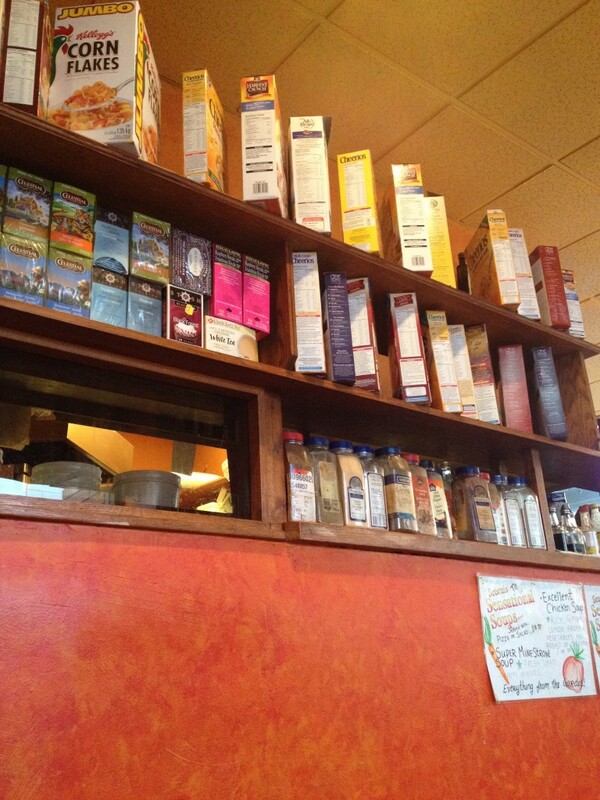 The food was lovely and reasonably priced. 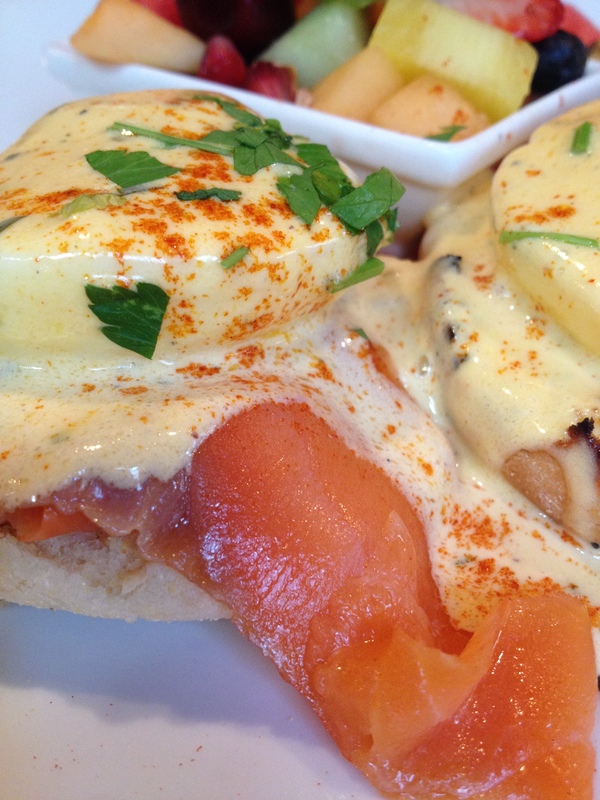 The Critic had the ‘bennies’ but not in their ham version; it was the British Columbia version with smoked salmon. 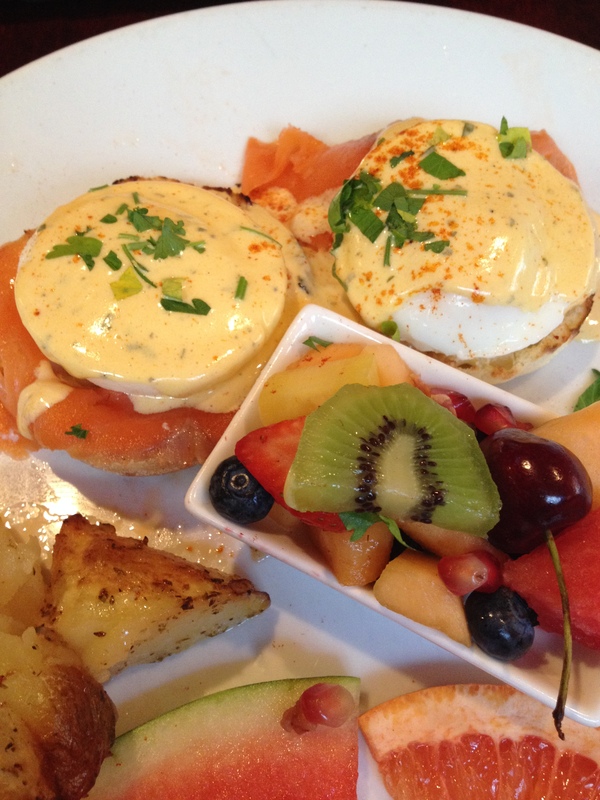 Unbelievably great and it is their justifiably famous hollandaise sauce that makes this signature breakfast dish pop. This was the first time that the Critic didn’t have to add salt to the baked breakfast potatoes to make the bland tuber taste like something – they were perfect just as they were. Better Half, insistent on eating a healthy breakfast, opted for a fruit and yoghurt combination. This being Vancouver where ethnic authenticity, along with political correctness, is all the rage, the fruit was local and the yoghurt was Greek. Coffee was strong and fresh. A great way to wake up the day. Or to wake up to the day. Or to wake up and then start the day. 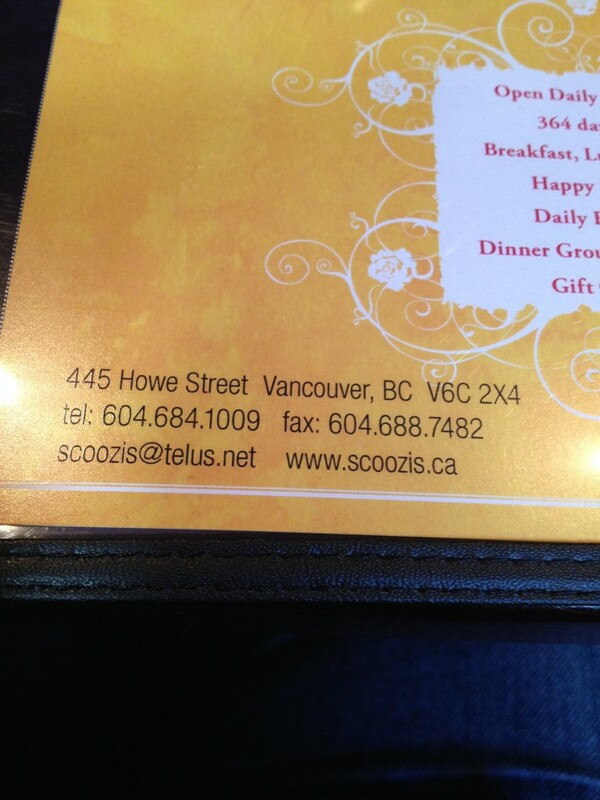 Whatever the phrase is, Scoozis is a great place for a real breakfast in downtown Vancouver. Au Pied de Cochon in Merida? Really? Well, kind of. The Critic saw the sign, a vinyl banner on one side of the Intercontinental hotel here in Merida, announcing the fact that Au Pied de Cochon was in their restaurant, a temporary visit by the chef with all his great food and the complete menu! Until the 17th of February, which yesterday, was tomorrow and is now today. If you know the Au Pied de Cochon restaurant in the Distrito Federal, you know that it is a nice – very nice – place to have some fantastic food and enjoy the good service typical of Mexico City’s restaurants where you had better provide good service to your customers or there are 17 people standing in line for your job. If you know that, you will understand the critique. If you don’t, click on the link to see their menu and location and by all means go and soon. The Critic made a reservation – the day before – for the Better Half and the MiniCritics both and all four arrived at the Frutas y Flores Restaurant in the Intercontinental restaurant here in the formerly white city of Merida, turning into the hotels underground parking lot in sentido contrario as it is not really clear that this is an exit, but the Critic digresses once again from the subject at hand which involves pigs and their feet; that is, the restaurant. 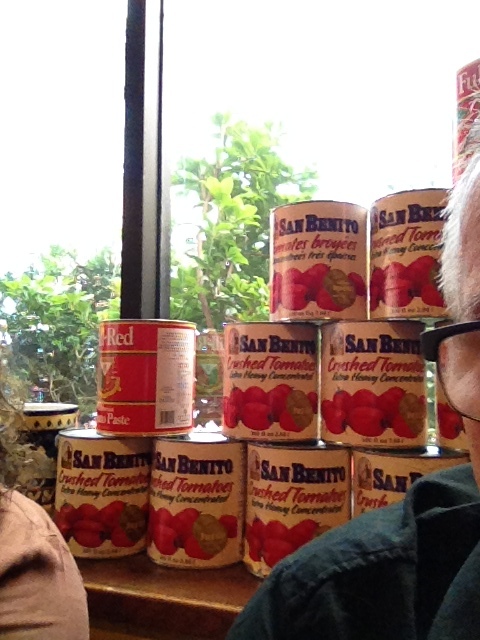 Standing in the entryway to the restaurant, the Critic immediately felt both silly and dismayed. Silly because he had made the reservation and dismayed because the restaurant, with the exception of one table, was completely devoid of human activity except for the waiters. At 8:30 PM, perhaps it was early. The young man at the door welcomed the party and when the reservation was mentioned, he smiled and said to choose any table. He then left the group to get to the table of their choice appearing when it was reached to help the ladies with their chairs. A bread basket, containing white rolls, probably baked on site, slightly warmed and accompanied by a pat of hard butter with the signature Au Pied de Cochon wax paper arrived soon after. Let’s stop here for a moment. If you have had the fortune to visit the Mexico City location, you have probably noticed that this is not what happens there: a) you will never find the restaurant empty; b) the hostess will never let you stroll in unaccompanied and pick any table and c) the bread basket contains a variety of delicious breads, only two of which are white rolls. If you haven’t been, you’re probably thinking everything is hunky-dory up to this point, or at least normal for Merida. The appetizers arrived and the usual Yucatecan question arose: the waiter picked up the French Onion Soup, looked at the diners and asked “Sopa de Cebolla“? The Critic has written about this infuriating lack of a system to identify diners before and so another demerit point was silently added to the experience. Why, in an empty restaurant, the waiters cannot make a note of who ordered what is beyond the Critics comprehension. The French Onion soup was superb. Cheesy, hot and full of flavor. The tomato soup was, well, a tomato soup, only luke warm and offered little in the oohs and aahs department. The Critic had fallen in love with the clam appetizer in Mexico City and had looked forward to this buttery cholesterol bomb all day and when it arrived, it disappointed. Both luke warm and lacking in the fatty deliciousness of the Mexico City version, it was just OK. The main courses. The ‘entire menu’ concept was a little misleading as there was no lechon confitado, con lentejas y tocino which the better looking Better Half had enthusiastically enjoyed and so she ordered the scallops. Mini Critics ordered duck confit and roasted pigs foot with Bearnaise sauce. The waiter returned a short while after taking the orders to inform the table that the duck confit was not available and would a duck breast do? Alas, the pigs foot was also unavailable and it was suggested that the roasted chamorro (a little higher up on the pigs leg) could be ordered instead. Perhaps it was because this was their last day, but still, one would expect they have everything on the menu when dealing with this level of restaurant. Just a thought. The Critic chose the rib eye with French fries and a green peppercorn sauce, thinking that it would be something along the lines of Trotters Steak au Poivre, with those delectable thin crispy potatoes that you can’t stop eating once you start. Everyone – well, almost everyone – thoroughly enjoyed their meal; the flavors were delectable although again, the food temperatures were not as hot as they should/could have been. The Critics rib eye steak dinner was the worst of the four: it was unevenly cooked, luke warm, thin as a bistek and the French fries were almost surely of the frozen in a bag from Costco variety. Highly disappointing, even with the addition of the rather glutinous green peppercorn sauce. For dessert, a creme brulee which was very good. In summary, the Au Pied de Cochon franchise lent it’s name to a promotion that will probably not garner them any fans and for those who are already fans, it was a huge disappointment. A recommendation or not is a moot point as today is their last day.